Tofino sits at the Western end of the Trans Canada Highway, where the ancient rain forest of Vancouver Island meets the Pacific Ocean. A small intimate town, Tofino is a natural hideaway or adventure getaway. Easily accessible by car, bus or plane, Tofino is a tranquil, beautiful destination. The diversity of visitors to Tofino is mirrored in the variety of accommodation: From camping, motel & guesthouse or hostel bed to bed & breakfast, vacation rental or luxury hotel, Tofino can accommodate all. Tofino has become a mecca for the outdoor adventure sportsman in all of us. Whether it’s simply strolling one of the many beaches or forest trails, or something a bit more daring like kayaking, surfing, sport fishing, scuba diving and whale watching. The surrounding nature makes Tofino a popular holiday destination for naturalists and conservationists, families and couples, the young and the young at heart. Tofino's location offers a unique perspective on eco systems and creates a fun filled break from urban life, with important education about our role in nature. As a vacation area, Tofino, Clayoquot Sound and the Pacific Rim National Park offer a dizzying array of family activities: native culture and art, some of the best fishing in the world and the ever relaxing hot springs, just a boat trip away. The ambience of Tofino with its art galleries, distinctive boutiques, gift stores, and its unique cafés & restaurants, invites you to explore this quaint and unusual town, that attracts visitors from all the corners of the globe. For acultural experience, take in a Tofino event at one of the seasonal festivals, a concert in Tofino, watch a movie in Tofino, or a play at the Clayoquot Sound Theatre or experience the First Nation’s culture of the Nuu-Chah-Nulth, who have lived here for thousands of years. 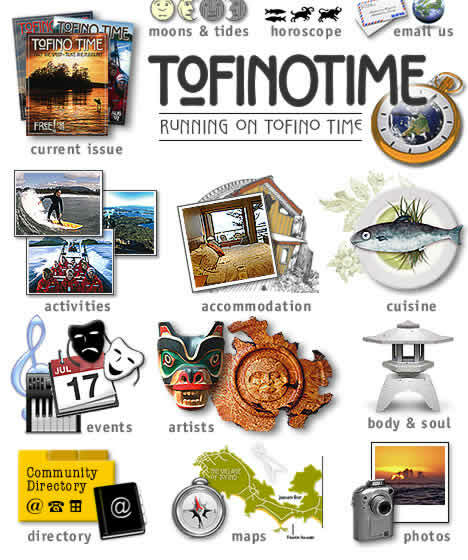 Tofino travel guide: Tofino accommodations, activities & events. 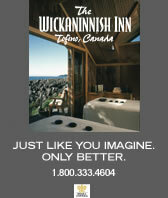 Tofino hotels, bed & breakfast, vacation rentals, restaurants & other tourism related businesses.